The Quad Envelope 60B represents another milestone in the world of modular synthesis, bringing together traditional modular UI with the extended feature set of an imbedded microcontroller based design. The easy availability of high clock rate uCs has allowed us to design an envelope that is both snappy and more versatile than any standard hardware envelope generator currently available. The use of 12bit DACs provide super smooth output with no audible stepping. This design uses a &quot;paging&quot; interface with four individual contour generators programmed by a common set of 7 panel control knobs and 3 switches. A panel with 28 knobs would be required to access all the stages if done the traditional way. The EDIT SEL momentary switch selects one of four channels to edit indicated by the panel LEDs. The knobs become &quot;live&quot; for that channel with the final edit settings stored to non-volatile internal EEprom memory. All settings are automatically restored on power up. Each channel has three modes of operation: Envelope, Gated Loop Envelope and LFO mode. Modes can be selected on any of the four channels independently of the other. The possibilities for inter module patching using a combination of these modes makes this module extremely flexible. It would require three or more modules to match the functions of just one channel. Some functions would be difficult to replicate with any number of modules. This mode functions as an envelope generator with a standard +5V gate firing the envelope.The stages include DELAY, ATTACK, HOLD, DECAY, SUSTAIN and RELEASE. The HOLD stage is a new feature unique in a modular Envelope. 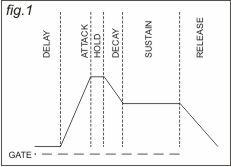 HOLD adds a variable width delay stage that holds the envelope at full amplitude between the attack and decay stages. Delay 0 sec 10 sec. The HOLD stage adds &quot;punch&quot; to the attack portion of the envelope, simulating the effect that compression has on peak transients. This is the purported &quot;Holy Grail&quot; for getting that Moog envelope shape. HOLD coupled with the sub-millisecond attacks, gives the envelope more impact than a standard ADSR can produce. Programmable CV AMT control for each channel sets the depth of modulation effect on the envelope stage timing using a 0 to +5V range. The greater the voltage input the shorter the envelope. Linear, Log and Reverse Log or Exponential. Each envelope curve response is programmable and saved with the mode and knob settings to memory. 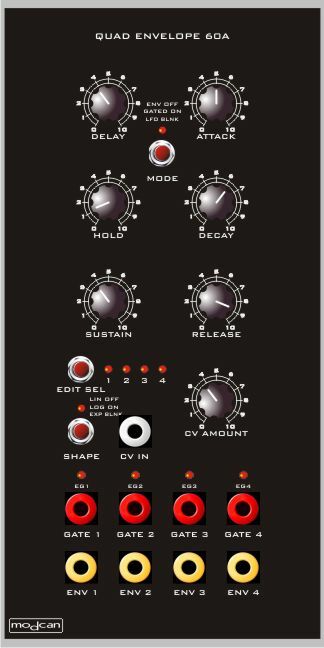 This is a unique modulation source with a wide range of applications. The Envelope Loop mode uses the Delay, Attack, Hold, Decay and Release stages. The attack, hold and decay stages determine the wave shape and frequency. The DELAY stage can be used to delay the on-set of the loop and the release stage is activated when the gate voltage drops to zero. The loop is active while the gate input is high. Some example uses: generate trills on a single note in a sequence or as a key activated LFO among others. The shape selector also effects the shape of the resulting waveforms. In this mode the channel functions as a 4 stage LFO using the Delay, Attack, Hold and Decay stages. This provides a huge variety of wave shapes from pulse/square to triangle, saw and everything in between all with continuously variable spacing and duration right up into low audio range. Great for sweeping filters, as a voltage controlled clock source or as an audio rate modulation source for VCO FM. Global CV Control of envelope and LFO stages per channel. Demo was done using the gated Envelope loop mode. on a neighboring channel for more control over shape. the hold stage to simulate compression. Two envelopes where used for filter cutoff and VCA. A third channel did LFO duty on the filter sweep.